Ancestry.com will be discontinuing one of its magazines, Genealogical Computing, effective with the July/August/September 2006 issue that is currently in the mail. Liz Kerstens, the editor of the magazine for the past seven years, and author of Clooz, is beginning a new magazine to take its place. Digital Genealogist will be similar in content and formatting, and will continue to feature many of the same authors and columnists. It will be delivered as a PDF and will be released as an attachment in November 2006. Subscriptions are $20 a year. To learn more, or to subscribe, visit www.digitalgenealogist.com. Join the developers of Legacy Family Tree on a 12-day Hawaii cruise September 19-October 1, 2007. Our 4th annual Legacy Genealogy Cruise will be the best ever! Don't just take a vacation. Take the vacation that's just more fun. We want to show you spectacular mountains, verdant forests, active volcanoes, and shimmering, thundering waterfalls. We want you to see the unsurpassed beauty of Hawaii in the grandest way possible. Your "Fun Ship" cruise visits four fascinating Hawaiian islands, with overnights in Honolulu and Maui. Brings lots of film so you can show your friends back home the unbelievable beauty and amazing colors of Hawaii. You'll have so much fun on your cruise, you'll want to tell everyone about the Aloha State. On this cruise, you'll enjoy one fun experience after another. 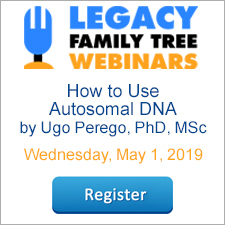 As always, you'll get to learn genealogy and Legacy from the experts. With over 10 hours of classroom, personalized instruction, you'll learn everything you need to know to master Legacy and begin researching more effectively. Contact our genealogy cruise director, Christy, at twivacations@comcast.net to reserve your spot today. Genealogical research is filled with contradictions. That is the overwhelming reason why we are looking for primary source materials, and settling for secondary sources when necessary. With secondary sources, however, we should be looking for multiple materials that are independent of one another in origin to help substantiate a fact. Learn how to misspell your family's names, forenames and surnames–-because they and everybody else did. Maintain a healthy skepticism of anything you have not personally examined, traced, and/or verified. The deluxe version of Legacy makes this easy. Just follow these steps. I've included an example of this chart below for your review. 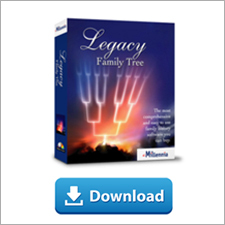 In the Family View, navigate to the desired starting person of the pedigree. Using Legacy's tagging feature, tag the people that you want to "colorize". You might have to turn on the tagging options from Options > Customize > General tab > Enable tagging options. Click on the Reports button at the top and click on the Pedigree tab. Click on the Report Options button, click on the Format tab and make sure that Put boxes around individuals is selected. Close. Click on the Color Text and Boxes button. Select Color all text and boxes the same. Select your desired color by clicking on the text and box color buttons. Check the option to Only color individuals tagged on number and select the tag number you used in step 2. The 38th annual BYU Genealogy and Family History Conference will be held August 1–4, 2006, in the BYU Conference Center in Provo, Utah. More than 100 classes will be offered throughout the conference, allowing participants to gain new skills and helpful information. Class topics include Beginning Family History, Family History Center Support, Computers and New Programs, Europe/Nordic Research, British Research, U.S. Research, Methodology, and Publishing Family Histories. We invite you to attend the conference to learn new techniques and to build and strengthen your family ties through genealogy and family history. Stop by our booth in the conference center (open to the public at no charge) and be the first to view these new CDs. The set should be available to all Legacy users at the beginning of September 2006. We have been experiencing some problems with our email and mailing lists since moving to a new server. We are aware that many of you may not be receiving our emails or our Legacy User Group emails. We thank you for your patience, and we hope to have this resolved as soon as possible. In the mean time, if you have ordered Legacy Deluxe from our website and have not yet received your confirmation email which contains the deluxe customer number, please give us a call at 1-800-753-3453. For support questions please call 1-425-788-0932. The 2nd edition of The Complete Idiot's Guide to Genealogy, written by genealogy superstars Christine Rose and Kay Germain Ingalls, was published in 2005, and is jam-packed of great genealogy advice for beginners and experienced researchers. Census research: have you done your homework? Did Great-Grandpa carry a rifle? View the book by clicking here. A person from whom you cannot help but claim descent. Americans have been fighting taxes since the country's beginnings - bad for our wallets - but good for genealogists. American researchers are blessed with an abundance of surviving tax records that can be polished into genealogical jewels. In Rootsweb's Guide to Tracing Family Trees, their "Taxing Tales" article explains the importance of researching tax records.